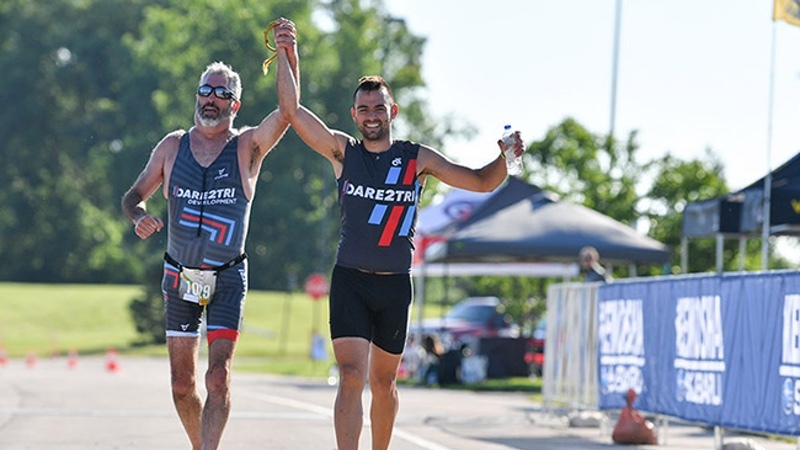 USA Triathlon and the United States Association of Blind Athletes (USABA) have partnered to host the first-ever paratriathlon camp in Colorado Springs dedicated to athletes with visual impairments. Ten triathletes and ten guides from across the US will travel to the US Olympic Training Center to participate in the three-day camp, set for Thursday, August 23, through Saturday, August 25. The Colorado Springs camp will focus on the para-specific dynamics of swimming, biking and running, as well as other aspects of triathlon performance (basic nutrition, transitions, goal-setting, etc.). Coaches will include seven-time ITU Paratriathlon World Champion Aaron Scheidies (Seattle, Wash.), 2017 USA Paratriathlon Coach of the Year and Paralympic Head Coach for Team USA, Mark Sortino (Boise, Idaho), and USA Triathlon certified coach, tandem pilot and triathlete Amanda Leibovitz (Bellingham, Wash.). Visual impairment is one of six paratriathlon categories recognized by the International Paralympic Committee (IPC) and includes athletes who are totally blind and athletes who are partially sighted but legally blind. Triathletes with visual impairments compete alongside a guide. During the swim, the guide and athlete are tethered together – usually at the thigh or hip. The athlete then rides behind his or her guide, or pilot, on a tandem bike before finishing the race on foot with a tether connecting athlete and guide. USA Triathlon serves as the National Governing Body for triathlon, as well as duathlon, aquathlon, aquabike, winter triathlon, off-road triathlon and paratriathlon in the United States. Founded in 1982, USA Triathlon sanctions more than 4,300 events and connects with more than 400,000 members each year, making it the largest multisport organization in the world. In addition to its work with athletes, coaches, and race directors on the grassroots level, USA Triathlon provides leadership and support to elite athletes competing at international events. This includes International Triathlon Union (ITU) World Championships, Pan American Games and the Olympic and Paralympic Games. USA Triathlon is a member of the ITU and the United States Olympic Committee (USOC).